Taipei, April 7 (CNA) Taiwan promoted its investment environmentto investors from China's biggest city Shanghai at an investmentpresentation held Wednesday in the capital city. Taiwan External Trade Development Council (TAITRA) Chairman WangChih-kang said geographically, Taiwan is in the center of the entireAsia-Pacific region. "It is shorter to travel from Taipei to Shanghai than from Beijing to Shanghai," Wang said. Therefore, Wang said he believes Taipei and Taiwan are the "idealspot" for Chinese enterprises to open Asia-Pacific operationalheadquarters. The presentation targeted an audience of Shanghai companies'representatives who are visiting Taiwan as part of a delegation ledby Shanghai Mayor Han Zheng. Attending the presentation were more than 50 Shanghai companies, including the SAIC Motor, Bailian Group and Shimao Group. The eventwas jointly organized by the TAITRA, the Taipei-based Chinese National Federation of Industries (CNFI) and Shanghai's Council for the Promotion of International Trade. The Chinese businesses are mostly big enterprises whose assetswere reported totalling over NT$1 trillion each. Han arrived in Taipei on Tuesday for a four-day visit, which isregarded as the climax of 10 years of exchanges between the capitalcity and Shanghai that began in 2001 when President Ma Ying-jeou wasTaipei's mayor. At the event Wednesday, Han said he will encourage Shanghaienterprises to invest in Taiwan. 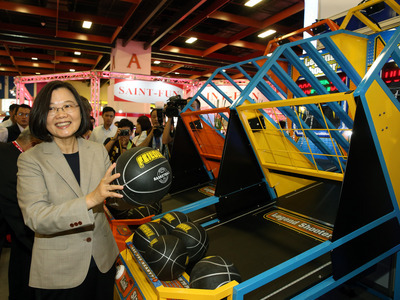 Since the first Taiwanese investor went to Shanghai in 1987, thecity has become a heaven of Taiwanese investments. Han said he hopesTaiwan will also become a heaven of Chinese investments. The mayor expressed that by linking Shanghai and Taiwan together,he believes companies on each side of the Taiwan Strait will be ableto enjoy better development. The presentation was part of Han's tight schedule on hissecond-day stay in Taipei, which started with a breakfast meetingwith Taiwan's influential entrepreneurs. Later in the day, Han rodetogether with Taipei Mayor Hau Lung-bin on the city's Mass RapidTransit Danshui Line and visited the Beitou Incinerator. Also on his agenda is a visit to Taipei's popular touristattractions, including the National Palace Museum, the Taipei 101skyscraper and the Eslite Bookstore in the bustling Xinyi district,according to the city government.